Britain's museums hold many musical treasures within their collections, many of which largely unknown and hidden in small and remote locations, or hidden among the multitude of objects in large displays. There are many things that can make an instrument a musical treasure: it might be made of rare and sumptuous materials; it might have been owned or played by royalty or it might have played a notable part in history. Here are some examples. 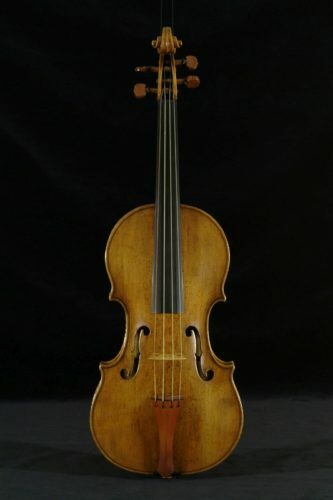 Andrea Amati was the first of a well-known family of Cremonese violin makers, and his instruments were greatly influential in the early years of violin making. This particular violin made in 1564, held at Tullie House in Carlisle, is one of a set made for King Charles IX of France, and is highly decorated with royal symbols. The instrument is small by today's standards, but would have been perfectly suited for a player of the time. Violin by Andrea Amati, 1564, held at Tullie House in Carlisle. Another violin from the same set is held in the Ashmolean Museum. This is a full set of Javanese gamelan in miniature. While less than half of the size of a normal gamelan, the instrument has the full complement of bells and gongs, and is fully playable. It was imported from Java in 1826, only just over 10 years after the first gamelan was imported to Europe, and was one of the first such instruments brought to the UK. 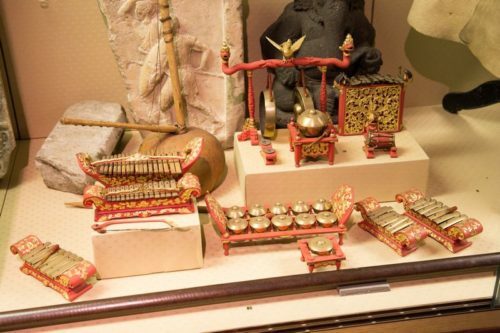 Miniature gamelan, one of the earliest sets to reach the UK, held in University of Aberdeen Museums. This has to be one of the most unusual instruments of all time: It is a near life-size musical automaton depicting a tiger mauling a European man. The instrument was made for Tipu Sultan, ruler of the South Indian state of Mysore from 1782-1799. The automaton has a handle which when turned, activates an organ concealed inside the tiger's body, and causes the man's arm to move up and down. In addition to being able to be played as an organ, sporadic sounds emanate from the device, imitating the wails of the dying man. 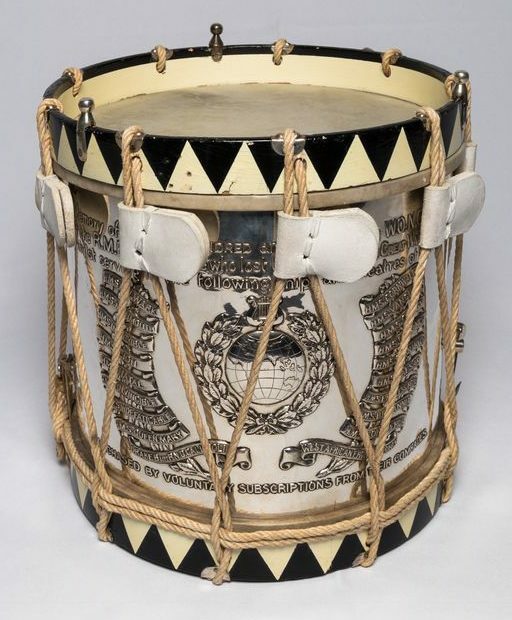 Although they are often highly decorated, military drums tend to be purely functional instruments; after all, they were actually designed to be used in the midst of battle. But this drum is different; its shell is made of finely chased silver. It was commissioned after World War I by the Royal Navy School of Music, as a memorial to former members of the school who lost their lives during the war. It is engraved with a coat of arms and the names of ships lost during the conflict. Although made from a precious metal, this side drum is fully functional and was used in performance in parades for a number of years. Silver drum from a larger set, made in memory of the 143 ranks of the Royal Marines Band Service who lost their lives in the First World War (1914-1918), held in the National Museum of the Royal Navy/Royal Marines Museum. The fanfare trumpet, also known as a herald trumpet, is specially designed to play fanfares, which are short trumpet flourishes used on ceremonial occasions to announce something or someone important, especially royalty. The exaggeratedly elongated bell is fitted with rings to allow banners to be attached. These banners typically are emblazoned with coat of arms or other heraldic devices. Despite their specialised use, most fanfare trumpets are played in exactly the same manner as an ordinary trumpet. 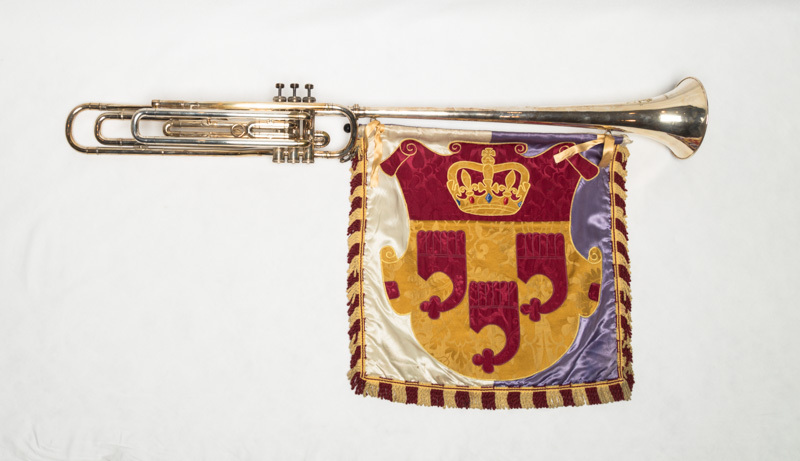 A fanfare trumpet associated with the Royal Military School of Music. Although the Celtic harp is typically associated with Ireland, the instrument has an extremely strong tradition in Scotland as well. The Queen Mary Harp is technically not a harp at all, but a clarsach, a type of Celtic harp with wire strings, rather than the more usual gut. This instrument is said to have been given as a gift by the Queen to the harper Beatrix Gardyn of Banchory in the 16th century. However, the harp is much older than that, most likely having been made in Argyll in south-west Scotland during the 14th or 15th centuries. 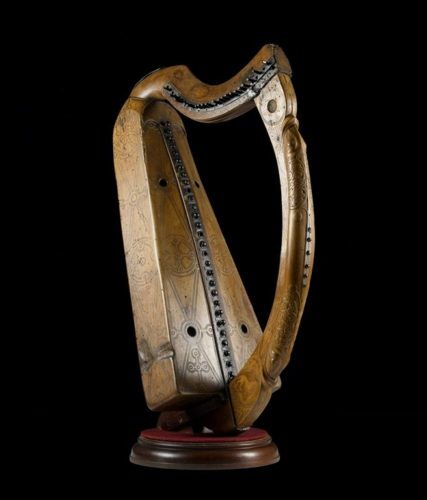 The Queen Mary Harp is one of only three original clarsachs in existence today. The clarsach is extraordinarily well-preserved, and is covered in beautiful carvings. On the Isle of Canna, located in the Scottish Hebrides, sits Canna House. Incredibly, this remote location holds a collection of historic 19th and 20th century musical instruments. Although the penny whistle is typically the most humble of instruments, this whistle held in the collection is the exception that proves the rule. 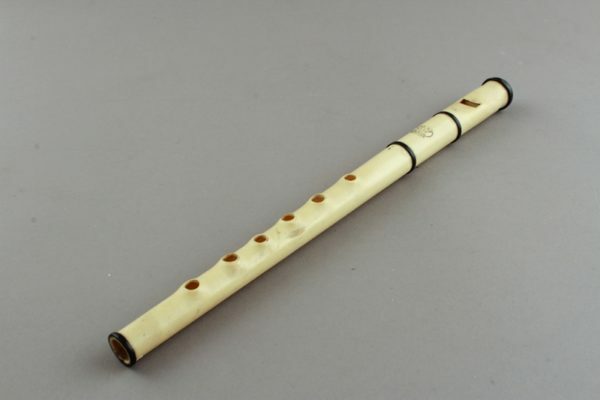 While penny whistles are usually made of painted tin - hence their other common name of 'tin whistle' - this French-made instrument is finely carved from ivory, and has what appears to be decorative bands made from ebony. Not exactly an instrument you'd expect to be played by a street musician! An ivory penny whistle, in the collections of the remote Canna House. The virginal is a type of small harpsichord that was particularly popular in Italy and England in the 16th and 17th centuries. While both the Italian and English versions of the instrument were typically highly ornamented, Italian virginals were often highly decorated, sometimes with ivory and elaborate marquetry. This Italian virginal however, is on a completely different level. It is decorated with the expected elaborate woods, but also has four carved ivory panels depicting putti playing different musical instruments. Its most striking decorative aspect - although probably added at a later stage in its life - is that it is completely encrusted with 1,928 precious and semiprecious jewels. The instrument is covered with (count them all! ):?857 turquoises, 361 pearls, 103 lapis lazuli, 28 amethysts, 58 topazes, 6 carnelians, 40 emeralds, 32 saphires, 117 garnets, 242 small garnets and rubies, 4 crystals, 9 agates, 52 jaspers, and 19 small jaspers and agates. While we typically think of organs as being keyboard instruments, this is not always the case. Especially during the 18th and 19th centuries, it was not uncommon for small organs to be made as mechanical instruments, which were played by using a crank to turn a cylinder that was studded with pins which determined the notes to be played. Such instruments were often used in small churches. Like their keyboard operated counterparts, these mechanical organs were often highly decorated and featured elaborate cabinetry. 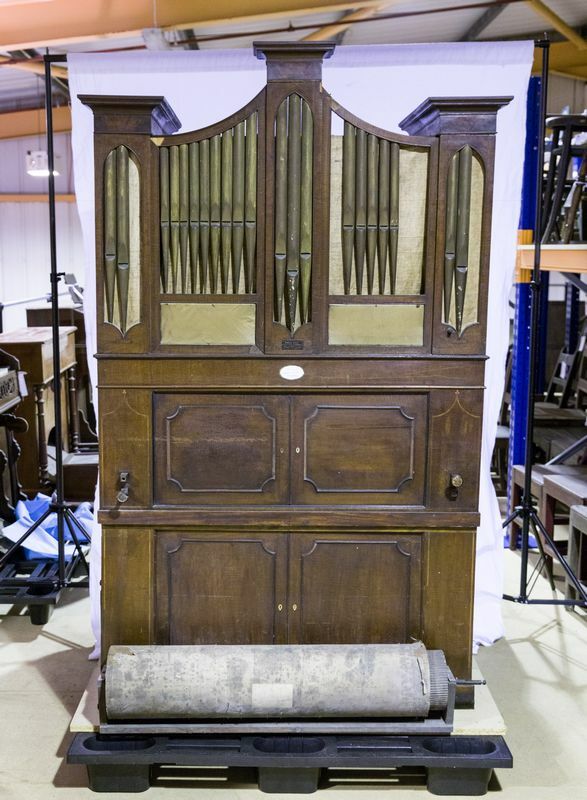 This mechanical organ, nicknamed the ‘Santon Seraphim’, was installed in the 1730s in Santon church on the Isle of Man.